Girl Kuripot Girl Kuripot: ETC News, Awe-SUMMER Photo Takes You to Boracay! Do you have an Awe-Summer Photo somewhere? I've got one from my Palawan trip! The picture below was an underwater adventure taken with Boy Kuripot last March 2008 in Coron, Palawan. We finally managed to get a good shot after ten tries of gasping for air and holding on to our lifevests. Take Note: This is a combined effort between the subjects "us" and our dedicated "camera man friend" who was also gasping for air and diving way below us at every take. Also cut my hair really short to beat the summer heat. That's another adventure to tell. This is a chance to win a 3D2N all-expense paid trip for to Boracay, where the ETC Beats is happening, this summer and it is being brought to us by none other than ETC! 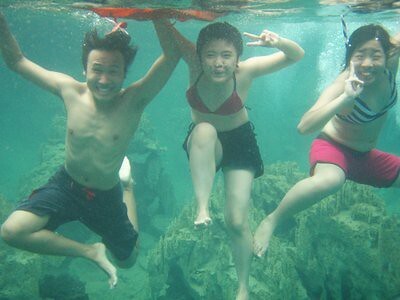 Just send ETC your most AWE-SUMMER photo together with a caption at etc.marketing@solar-entertainment.com. Contest ends on March 21, 2012! Travel period is on mid-April 2012. Have an AWE-summer day! It's super hot in Manila, maybe I can join ETC's summer beat in Boracay Haha. Click here to join ETC's Win an All Expense Paid Trip to Boracay for 4.